The classic strategy title returns on Facebook and Zynga later this year. Despite its flaws, 2004's Evil Genius remains a fondly remembered title. It took the whole Dungeon Keeper management simulator and painted it in 60's super-spy psychedelica. So what if I told you that it's returning later this year as Evil Genius Online ? Pretty cool, eh? No, it's not thanks to Kickstarter, it's Zynga! Wait, don't go! 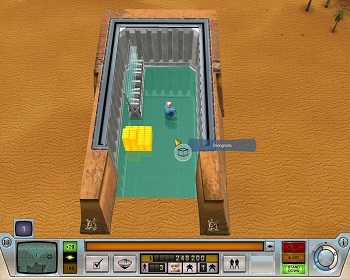 The original game had players construct secret lairs filled with traps, torture chambers, and laboratories as they sent minions out to conduct evil on a global scale. Hosted on Facebook and Zynga.com, Evil Genius Online aims to stay true to the original and allow players to "form evil syndicates, send spies to rival lairs and share rare and crucial items in the form of bribes." If that sounds too much like every other "social" game, don't worry, because it's got the original game's sense of humor. Humor's cool, right? "As an independent developer, it's crucial that we really explore free-to-play beyond mobile games," announced Rebellion CEO and creative director Jason Kingsley. "We challenged a small team here in our Oxford studio to create a social game that was not only compelling, but technically impressive and we just kept coming back to Evil Genius - the lair construction, the strategy, the humor - it was just a perfect fit." Those interested in seeing for themselves just how Rebellion plans to pull this caper off can sign up for the closed beta here. Be fast, as Rebellion is only taking 500 applications!